The model is available in OBJ and 3ds Max formats and all texture maps are provided. 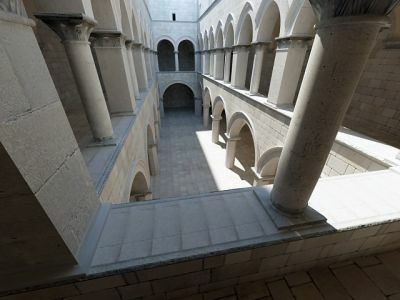 You can download the Sponza model HERE. 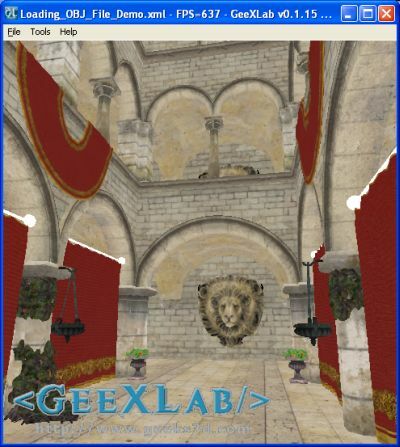 Just for fun, I quickly tested the OBJ format in GeeXLab with basic texturing and no lighting. I cleaned a little bit the material file to make relative the path to textures and also removed the Tr coefficient (transparency for GeeXLab). When I’ll find a little time, I’ll try to improve the rendering by using the normal maps and other ambient maps (all available in the download). According to GeeXLab, the OBJ version of Sponza model has 279,163 triangular faces.